Best of SL LIVE is the latest effort by the Best of SL Team to bring out the best of SL for everyone else to enjoy. This contest is for the LIVE solo singers and bands of SL - a chance for them to pit their talents against those of other LIVE vocalists - a chance to win L$25,000 and the title of the Best of Second Life Live Vocalist. All interested entrants are required to enroll in the "Best of SL LIVE" group (L$100 entry fee) by the 15th of November. Auditions start November 17th. Contestants are required to have their own audio stream and will be allowed to audition in front of our judges and perform up to 2 songs (total of 5 minutes). At the end of the audition process, 10 contestants from each category - solo and band -will be chosen to compete against each other. Each week beginning January 5th 2008, all contestants will perform LIVE for the judges at a different music club in SL and will be rated by them. After this, all SL citizens will be able to vote for their favorite performer at the Best of SL LIVE website (http://www.bestofsllive.com). In each subsequent week, two contestants in each category - solo and band - will be eliminated based on votes from SL citizens. On February 9th, 2008, will be a final showdown between the last artist standing in each category, but there will only be ONE winner. SLers will choose their favorite vocal artist and give them the title "Best of Second Life LIVE!" Ravelong SL & Doubledown's DJ Shop is a proud sponsor of the event. 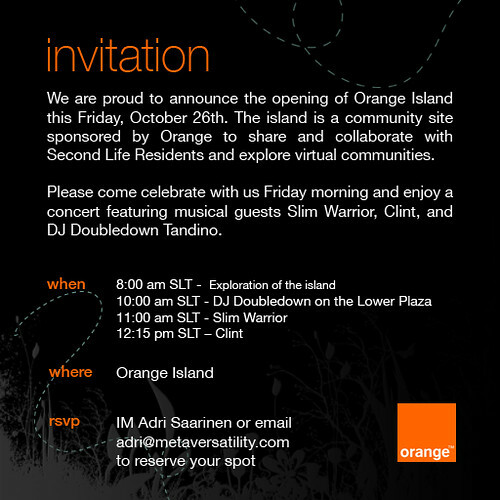 It has been a long time coming, but Metaversatility is proud to announce the opening of Orange Island in Second Life. On behalf of the entire OrangeSL Team, we’d like to invite you to celebrate with us this Friday morning with a concert and island tour. SLNN - Orange you glad you use Second Life? Brad Reason quit his day job as marketing and entertainment director for a restaurant group in Baltimore to make his living in a virtual world called Second Life. "It was a good job I was giving up," Reason said. "As I was working there, I started to get into Second Life, and I realized the amazing potential. At the point I quit, I wasn't even close to making enough to survive on. Once I was able to devote a good 40 hours a week, the possibilities opened up." Reason, 28, along with some of the world's most successful companies - including Toyota and International Business Machines - see vast potential in Second Life. In this simulated land, more than 9 million computer users from around the world take on digital personas - cartoon-like characters called avatars - that allow them to live out their dreams, however unlikely or impossible. People get married, start businesses, build homes, travel and hold down jobs just as they do in their "first life." They buy and sell and start businesses. There's even an official currency, Linden dollars, that can be cashed in for real dollars, at the rate of about 270 Lindens to the dollar. Companies still are trying to figure out the best ways to handle this new virtual world, said Lee Richardson, professor of marketing at the University of Baltimore Merrick School of Business. "I expect at first they thought it was some loony bunch of nerds," he said. "A lot of companies go in there and are still not sure how to attract these avatars. It's kind of like landing on Mars and finding it civilized." There have been examples of companies that tested the waters and got out quickly, but many more are experimenting. American Apparel opened its Second Life store on a private island - a virtual island that both companies and individuals can buy, with real dollars - in June 2006, at a time when there were fewer than 200,000 registered users of Second Life, and later pulled out, according to the retailer. "We tested an idea, played with a concept and hopefully learned a few things about what online shopping might look like in the years to come," said Raz Schionning of American Apparel. Washington intellectual property boutique Greenberg & Lieberman credits its virtual office in Second Life with making contacts that resulted in about $20,000 in real-life legal business this past year, according to partner Stevan Lieberman. "To most larger firms, $20,000 is meaningless, so you're not going to see the big firms going in here right away," said Lieberman, who specializes in computer patents. "To a little guy, a little bit of money makes a big difference. Any new way I can advertise on the Internet is great." Lieberman believes the 3-D medium will grow quickly. "When people meet in Second Life and there's an avatar, it's like meeting a person," he said. "There's a level of trust, and that will translate into more Internet sales." Companies also can use Second Life to enhance business in ways other than buying or selling, said Edward M. Roche, director of scientific intelligence for Barraclough Ltd., a research company. "You might have a new product line and want to see what the cyber generation thought of it," he said. "So you get people to look at new products that wouldn't be economically feasible to do in the real world. Simply trying to build an exact copy of a brick-and-mortar store and running it the same way is not the answer." Reason, known as Doubledown Tandino in Second Life, runs a virtual shop and sells products for clubs and music venues there. He also works as a DJ and recently - from his home computer - orchestrated an online book-release party for a real-life book called Second Life: A Guide to your Virtual World. "Second Life, or at least some 3-D virtual platform, will take over the Internet in five years," said Reason, who said he doesn't yet make as much money as he did at his day job. "The majority of people think it's just some kind of cult video game, but that's what they said about the Web. I'm in there so I can experience it from the get-go." Started in 2003 by Linden Labs of San Francisco, Second Life constantly evolves because it is created by its registered users. A basic membership is free, with upgrades, payments for virtual land and in-game currency - all billable to a real-life credit card. Each day, conversions of Linden dollars to U.S. dollars and vice versa amount to the equivalent of $250,000, according to a Linden Labs spokesperson. In September, 855 people made $1,000 or more in real money - and 138 of those more than $5,000, according to Linden Labs, which issues monthly reports on transactions. Damian Hart, an adjunct professor at the University of Baltimore who teaches a class in Second Life, said retailers are waking up to this parallel universe, just as they gradually caught on to the potential of the Internet in the mid-1990s. "They've finally heard of it," he said. "They're trying to figure out how to get involved. I think we're going to see an explosion as soon as businesses can see a way to turn this game/not game into a way to make real money." IBM owns more than 30 islands in Second Life where it holds meetings and training, does real-time collaboration and operates a 24-hour business center staffed by avatars, a spokesman said. Often companies that come into Second Life are trying to create an aura around their brand rather than trying to sell products. "We're just getting brand awareness out there and having Second Life residents have a good experience with Scion," said Allison Takahashi, a Toyota spokeswoman for the sporty economy car. Plenty of individuals, too, are experimenting in Second Life. Circe -----, known as Circe Broom in Second Life, owns a club, a concert hall, an Egyptian-style stage and a park venue overlooking the ocean in the virtual world. The former jazz singer, who now uses a wheelchair, hires real people who play on real stages separately from, or sometimes simultaneously with, their Second Life gigs. She pays artists the equivalent in Lindens of roughly $13 an hour. The artists sell CDs and single-track MP3s at her stores. Each gig may not bring in big money, but the artists also make tips. One made $125 in tips in addition to the $13 she paid him. And many play 25 shows a week, she said. Broom earns income from an "in-world" job for the real-life company RatePoint.com, which has a cafe in Second Life for which she arranges music artists. RatePoint.com rates Web sites based on people's comments. But she also spends about $1,400 to pay for real artists, and currently is reimbursed for only about half of that, she said. "Someday I hope to break even," she said. "I love it. It's my hobby. But it is eating into my resources. I'm not Carnegie. I'm not Rockerfeller." Neither is Reason, and his "first life" and Second Life have merged in a way that most people aren't daring enough to try. But he doesn't seem worried. "With the growth I've had, I'd be doing good by January or February," he said. "The possibilities are so unlimited - even more so than in real life." Virtual Live Band From the press release: "There will also be a panel discussion titled, "Jazz in the 21st Century: The role jazz plays in promoting American values overseas and how new technologies like Second Life are helping." Panelists include Joshua Fouts, Director of the USC Center on Public Diplomacy, Charles Fishman, Executive Producer of the Duke Ellington Jazz Festival, and John Stevenson, Director of the Central Programs Division at Voice Of America. "Go check this event out! DJ Jenns - THE TENMINMIX COMPETITION VIDEO. Morris! Thank you! You da man! Your track - and He wants to hear it. Remixing is just one possibility. Produce and record your own song inspired by Herbie Hancock's music. Take elements from any Hancock track - play or combine them in your own way and show Herbie what it means for you. With this special remix contest hosted by the renowned Jazz musician Herbie Hancock, Universal Music Germany will launch the new brand Pangaea Island. Hancock's early engagement with new musical forms of expression made him a pioneer in the generation of electronic sound in music. Launched along with Ableton, this contest is intended as jump start of activities which focuses on the musical potential of virtual worlds like Second Life - including its advancement and promotion. The winner of the contest can expect Abletons "Live 7" program, amounting to 599 USD, and the chance of a follow-up release by Universal Music Germany. All you have to do is after you have listen to Herbie Hancock: Send an e-mail to contest@pangaea-island.de. Afterwards we will send you a link to the piano track of the Song Solitude from Herbie Hancock`s New Album River: The Joni Letters. Regardless if you use this track for your own creation, or not, there are two possibilities to bring your track into the contest. A) The first is to upload it at Vudyo (http://www.yudyo.com/) in the "Herbie Hancock Remix Contest Group". This gives you and us the chance to get a first feedback from the audience and other participants. B) The second opportunity is to send your finished track to contact@pangaea-island.de. Deadline is the 15.11.2007 / in case of extension the 01.12. 2007. Well this afternoon Electrolux, the Gronstedt Group, and Millions of Us finally unveiled a plan we’ve been working on for quite a while. First we announced the winner of the “Invent a Word” contest. Doubledown Tandino won himself $100,000 Lindens with his word “Metapparatus - An all encompassing tool used in a virtual world to make interactions and processes easier.” The other 30 participants in the word creating exercise will earn $1,000 Lindens each as well. Then we came to a very special announcement for our project: the Electrolux Innovation Grant Program. This is a program to really engage the Second Life community and work with them on their terms, not in pre-canned typical corporate experience way. Since Electrolux has been strongly committed to recognizing innovation within both the real world and the virtual one, this grant program is the perfect way to foster and encourage innovative minds within the community. Already the reaction from the kick off ceremony this afternoon has been overwhelming and positive. [12:46] Doubledown Tandino: this is incredible!! ive actually been looking at ways to do this. i had no idea how to submit inventions. [12:52] Doubledown Tandino: finally i get to utilize all these doodles and scratch pads of stuff i couldnt make! So now we need to spread the word and let people know about this program so we can get some cool proposals in before November 1st. If you or someone you know is an aspiring Second Life inventor, creator, or innovator, get involved. Let them know we’re looking for cool people or teams to sponsor. Are you a Second Life innovator, creator, or inventor who wants a chance to make the great idea you’ve always had come to life? Now you can have the help you need to make your visions a virtual reality. The Electrolux Innovation Grant Program is looking for creative teams or individuals to help support cutting edge new ways of making all of our Second Lives even better. Second Life residents will be encouraged to submit ideas for useful devices designed to solve a specific challenge. They can present ideas already in development or projects that are still in the concept phase. They can work either as a team or as an individual. Electrolux will decide among the submissions which projects they deem worthwhile, feasible, and able to be completed. From the projects they select (a number at their discretion) they can then award them significant amounts of grant money in Linden dollars based on merit. 1. Describe the problem you’re trying to address. 2. Describe a thoughtful, cutting-edge and innovative solution that is based on consumer insights. 3. Describe how you or your team is prepared to meet that challenge. 4. Describe how long you think it will take your team to complete the project. 5. Be as detailed as possible. How is this innovative? Will it be free or for sale? How will it help Second Life users? A private team of Second Life innovators, Electrolux employees, Gronstedt Group representatives, and Millions of Us members. Grants will be awarded in amounts of $25,000 Lindens for accepted proposals. Upon reaching a decided upon halfway milestone, a second $25,000 grant will be given. Projects that are finished and released into the community will be given a final $50,000 Linden award grant. As a special recognition, the project completed and deemed most innovative by the judges will have its inventor or team avatars be permanently added to the display of great innovator paintings in the Innovision Hub. Entrants own the intellectual property rights to their entries. Electrolux will NOT own the invention. If inventors would like to name or include Electrolux’s Innovation label on their product somehow of their own choice, we definitely are open to that. Grant proposals should be submitted by Thursday, November 1st. At that time grant winners will be contacted within 7 business days by Electrolux. Further group meetings to discuss projects will be held weekly at the Innovision Hub. Alright Second Lifers, get the word out there! adj. A conditional identity one may encounter while traveling between realms in Second Life usually resulting in auburn dome hair, abnormal ugliness, sexual androgeny, and an overall confused sense of self. Featuring some of SL’s celebritiesand many other shifty characters. The gallery will be on display throughout October. If you're looking for high NRG hardstyle, DJ Atlas Josten is da man! Atlas and I go way back to the early days of Club Republik. Atlas has a banging selection of hard hard peak hour rave joints, and has an excellent voice on the mic as well. I was impressed and mesmerized with House Divaz as well. A trippy eye-candy club build. In fact, as soon as I arrived, I forgot to even notice who was DJing or what was going on... I began poking at the lime jelly. Anyway, very cool visuals. I made it as an Event of the Week in issue 42 of The Avastar. WOOO! "Welcome Back Doubledown" was featured under "Nightlife"
Also, the Multimedia Arts Center (MMAC) is having their 6 month celebration. Be sure to catch me perform on October 8th, 5pm slt. The MMAC will be having entertainment all week. I want to thank Electrolux and Millions of Us for honoring me with this award. It was such a huge treat to hear I am in the ranks of the other innovators mentioned. It came as a big suprise and I'm still glowing from the acknowledgement. I am glad I could represent the SL DJ community in this way, and it's cool to see my name listed with SL geniuses. Sometimes it can be tricky for a company to figure out exactly how to enter Second Life. A few have tried and struggled with setting up a storefront that mimics their real life presence, only to find that users in Second Life had a completely different set of needs and expectations. For international electronic appliance company Electrolux, the challenge was even more unique. Electrolux is a company that sells items like washing machines and vacuum cleaners. Useful in real life, but not so in a Second one. So the minds at Electrolux and Millions of Us teamed up to come up with a unique and creative solution to this challenge. Electrolux spent months researching and talking with Second Life users to identify their needs and problems. Instead of simply setting up shop and waiting for the community to come to them, they went to the community to understand what made it tick. Ultimately they realized that Second Life was a thriving virtual world full of people who were as innovative and creative as their own researchers. What emerged from this process was a virtual building dubbed the “Innovision Hub.” A place to recognize the achievements of real life innovators as well as the budding ones inside Second Life. To demonstrate their appreciation and recognition of the emerging in-world innovators, Electrolux opened their building with a special ceremony to recognize and celebrate the most creative and exciting inventors in Second Life. The Innovision Awards were held at the top of the light bulb shaped building in a quirky and fun pavilion. The biggest and brightest names from around the community came out to participate. In addition to the awards given out to the 10 innovators, Electrolux also held a discussion panel with everyone gathered to talk about the unique challenges and issues Second Life inventors deal with. Afterwards the party moved downstairs where Electrolux hosts showed off an interactive wall that lets users invent a whole new word and share it with other visitors. The grand prize for best invented word is $100,000 Lindens to be given out in 2 weeks on October 18th at the Innovision Hub. Soon after the gathering turned into an avatar costume contest where some of the users showed off their most crazy and unique avatar creations. More Flickr photos of the event here. Shep Korvin - creator of the original Lucky Chair and various other viral marketing tools in Second Life - Shep’s original viral marketing creation the “Lucky Chair” is now fairly ubiquitous in Second Life and has even seen emergent behavior form when bands of people created Lucky Chair Strike Force groups to round up content housed in Lucky Chairs. He’s since developed an in-world auction sales system, and “MobVend” which lowers the price for goods the more avatars in a defined radius. MSo Lambert - creator of the Subscribe-o-Matic group information distribution tool - Subscribe-o-matic is a group update system which circumvents the flaws in the Linden provided group system. Subscribe-o-matic automatically generates an RSS feed for announcements and prevents the hated group IM chatter which no one can turn off. FlipperPA Peregrine - creator of the SLTrivia.com system - SLTrivia is a resident created trivia question and answer system similar to the systems which are played in many RL bars. SLTrivia also supports banner advertising with engaged players who are enjoying themselves trying to answer trivia questions retrieved from an out-of-world database system. Francis Chung - creator of the open-source Franimation AO system and the amazing Dominus Shadow - The Dominus Shadow is probably the best known car in Second Life. Styled after the classic Ford Mustang the Shadow can also turn itself into a hovercar. The Wet Ikon/Franamation animation override provides the basis for just about every animation overrider in Second Life. It was one of the first to take advantage of animation override permissions back in the very early days of Second Life. Jorgen Friis - Created the Interactive Wall for Electrolux Innovision Hub which allows users to drop notecards which are read by the wall and stored inside the system for other users to read and share anything from word definitions to famous quotes with each other. Keiki Lemieux - creator of the HUDDLES animation HUD - The HUDDLES system can animation not just the user of the system, but also other avatars. Additionally, it features one of the clearest and nicest looking animation activation HUDs in Second Life. Doubledown Tandino - DJ extraordinaire - always has an innovative mix of house beats and cool jams over top - Every show’s an adventure in layered sound and mashups. Sasun Steinbeck - Made a “only in Second Life” prim sculpture that changes and morphs shape as avatars touch it, and also created kiosk.net - the network content distribution system that vends the art gallery notecard all over Second Life. Flea Bussy - The man who runs Grendel’s Children, already known as one of the most amazing prim and texture artist in Second Life with an incredible sim sized store to house the amazing creations of Grendel’s children. 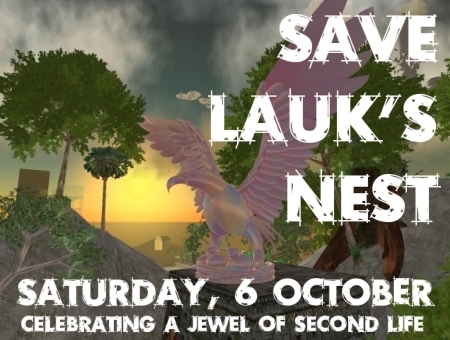 The drive to save Lauk’s Nest from doom as a result of the sudden European Value Added Tax policy imposed by Linden Lab continues in the best way that the Second Life art community knows how - with an awareness-building art show and music event! Artists - visual and musical - will be added throughout the course of the week, so check back in for an updated list of event.